Here's the funny thing. I don't even like cats. But it seems that all my favorite picture books- Kitten's First Full Moon by Kevin Henkes, Skippyjon Jones by Judy Schachner, and now Posy- are about kitties! 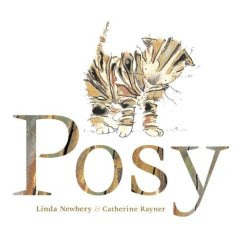 Can I have just a moment of your time to GUSH about Posy, written by Linda Newbery and illustrated by Catherine Rayner? The watercolor, pen, and ink drawings are the perfect complement to a wonderful little rhyming story of a curious kitty's adventurous day. Favorite page: Posy gets caught up in a deliciously pink ball of yarn.